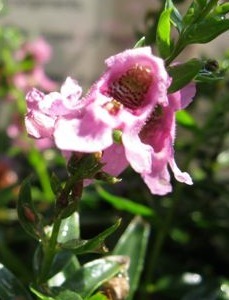 Angelonias grow in sun with regular water and bloom all summer. They make a great container or bedding plant and are a long lasting cut flower. Although they are a perennial in their native tropics they do not winter over here. They come in white, pinks, purples and blues and the height varies from 8 to 18 inches tall depending on the hybrid variety. I have heard them called the ‘Summer Snapdragon’ and they are listed as deer resistant but I would not bet on it, otherwise they are very pest resistant. We sell them in 4 inch pots and they are a dollar off the regular price in July-so $3.59. It is fire season and many of you know that we had quite a scare here at the nursery a few weeks ago with the fire in the creekbed behind us. Thanks to our firefighters and townspeople it was contained in the creek fairly quickly. Watching the Digger Pines ignite was quite enlightening. As I write this the Butts Fire is happening, which brings us to the beginning theme of this newsletter-fire resistant landscaping. As with waterwise landscaping less is more. Leave space between plant groupings. Choose plants that do not accumulate dead branches, needles and twigs and have high moisure content and low resin. Low height plants are a better choice for close to the home in general. Most deciduous trees and shrubs are considered fire resistant as long as they have a watery type sap. Pines, juniper and other conifers are full of resins and should be planted a distance away from any structures. I am a big fan of leaf litter but hot ash from a nearby wildfire can ignite it or any other type of bark covering. CalFire would prefer you use stone covering, at least in areas where a fire break is needed. Pools, driveways and patios are another useful firebreak. I know we are in a drought but making sure your plantings are hydrated is another factor. Groundcovers include – iceplants, sedums and succulents, manzanita uva ursi, rockrose “Sunset”, ceanothus prostratus, wild strawberry and creeping veronica. 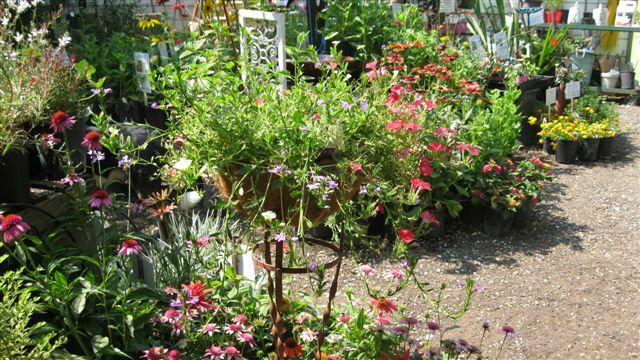 Perennials – Berginia, coreopsis, daylily, echinacea, gaillardia, evening primrose, iris, lambs ear, hosta, lavender, pennstemon, all sages, native monkey flower, and russian sage. Shrubs – Most deciduous shrubs but these evergreens are included- Ceanothus, Rockrose, Toyon, Cotoneaster, Mahonia and Manzanita. Trees – Hardwoods like oaks and most deciduous (not pines, firs or other conifers). Bugs continue to plauge and earwigs are out in force. We sell the natural Sluggo Plus bait that works very well for earwigs. Most of our sprays are organic but that does not mean non-toxic. To avoid hurting bees and other beneficial insects sprays need to be applied very early in the morning or late in the evening when they are not active. Once dried they are safe for them. We also carry Ed Rosenthal’s Herbal Spray which is non-toxic. I was reading my Master Gardener Calender and saw that they recommend doing your apricot and cherry pruning in the summer after harvest as opposed to winter. This is to prevent Eutypa dieback, a fungal disease that infects the trees when pruned during the rainy season. It will cause sudden and wilting dieback in the summer, dark sores on pruning wounds and bark discoloration with gummosis-an amber colored gum. Dave Wilson also recommends light summer pruning on most of your trees to keep them at a manageable size and to avoid heavier pruning that removes your fruit producing wood in the winter. July means we are back to being closed on Wednesday now that the spring rush is over. It also means we have loads of great summer blooming perennials like dahlias, black-eyed susans, coreopsis, cone flowers and russian sage. Our supplier’s beautiful 4 inch zinnias are here and we finally have the colorful annual vinca and lantana in. 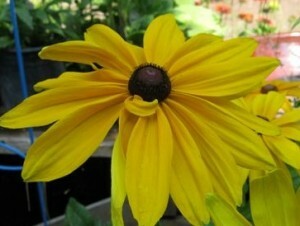 These are both deer resistant and very heat tolerant and long blooming. 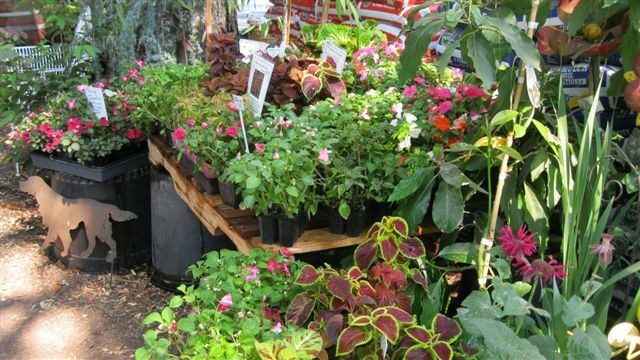 For shade we have beautiful begonias of all types, colorful coleus, fuchsias and impatiens. The crape myrtles are beginning to bloom along with the hardy hibiscus and rose of sharon. We still have plenty of roses to chose from and a good selection of fruit and shade trees.